According to a new study published in the American Journal of Preventive Medicine, nearly four in ten of all youth who died by suicide in 16 states between 2009 and 2013 were Medicaid enrollees. “Almost 40 percent of youth who died by suicide were covered by Medicaid, suggesting effective suicide screening of enrollees could substantially decrease suicide mortality in the United States,” explained lead investigator Cynthia A. Fontanella, PhD, Department of Psychiatry and Behavioral Health, The Ohio State University Wexner Medical Center, Columbus, OH, USA. While the overall rate of suicide was consistent for Medicaid and non-Medicaid groups and the highest suicide rates in both groups were among older youth and males, there were notable differences in a few demographic subgroups. For example, there were significantly higher percentages of suicide among the Medicaid population of youth aged 10 to 14 years, females (regardless of age), and individuals who died by hanging. This is valuable information that can be used to better target screening and prevention efforts and help meet the National Action Alliance for Suicide Prevention’s Research Prioritization Task Force (RPTF)’s goal of reducing suicide deaths and attempts by 20 percent by 2025. The study analyzed data on the 4,045 youth, aged 10 to 18 years, who died by suicide between 2009 and 2013 in 16 states: California, Florida, Georgia, Illinois, Indiana, Massachusetts, Michigan, Minnesota, New York, North Carolina, Ohio, Oregon, Texas, Virginia, Washington, and Wisconsin. These states represent the ten most populous states in the US, span all regions of the country, and account for two thirds (65 percent) of the total child Medicaid population. Death certificate data were matched with Medicaid data and the Injury Statistics Query and Reporting System. Age-, gender-, and cause-specific mortality rates were calculated separately for both the Medicaid and non-Medicaid groups. Suicide is the second leading cause of death among individuals aged 10-24 years. More teenagers die from suicide than from cancer, heart disease, AIDS, birth defects, stroke, pneumonia, influenza, and chronic lung disease combined. In pursuit of the National Action Alliance for Suicide Prevention’s shared vision for a “nation free from the tragic experience of suicide,” the RPTF released a research agenda aimed at reducing suicide deaths and attempts by 20 percent by 2025. To achieve this goal, they recommended that targeted interventions within “boundaried populations” (e.g., population defined by a service setting or organizational function) be an immediate research focus because of the ability to identify and reach large numbers of individuals with highly concentrated suicide risk within service system settings appropriate for intervention. 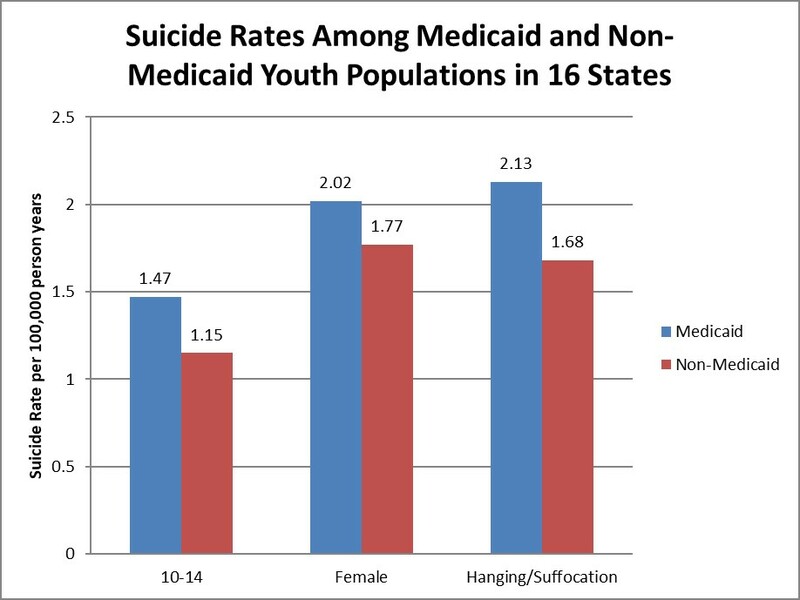 While the overall suicide rate did not significantly differ between the groups, compared with the non-Medicaid group, the suicide rate in the Medicaid group was significantly higher among youth aged 10 to 14 years, females (regardless of age), and those who died by hanging. The Medicaid program is an especially important boundaried setting for youth suicide prevention efforts. In any given year more than 36 million children are enrolled in Medicaid and they experience more suicide risk factors, including mental illness, compared to the general population. Despite the broad reach of the program, no previous studies have examined suicide among youth enrolled in Medicaid. The few existing studies of suicide mortality within health systems have focused on adults served by the Veterans Health Administration, enrolled in one state’s Medicaid program, or an HMO network. The article is “A National Comparison of Suicide Among Medicaid and Non-Medicaid Youth,” by Cynthia A. Fontanella, PhD, Lynn A. Warner, PhD, Danielle L. Steelesmith, PhD, Jeffrey A. Bridge, PhD, Guy N. Brock, PhD, and John V. Campo, MD (https://doi.org/10.1016/j.amepre.2018.10.008). It appears in advance of the American Journal of Preventive Medicine, volume 56, issue 3 (March 2019) published by Elsevier. Full text of this article is available to credentialed journalists upon request; contact Jillian B. Morgan at +1 734 936 1590 or ajpmmedia@elsevier.com. Journalists who wish to interview the authors should contact Eileen Scahill, Senior Consultant Media Relations at The Ohio State University Wexner Medical Center, at +1 614 293 3737 or eileen.scahill@osumc.edu. This project was supported by Grant SRG-0-200-17 awarded to Dr. Cynthia Fontanella from the American Foundation for Suicide Prevention.